"William, you are a bold fresh piece of humanity." In 1957, in the heart of the Eisenhower years, in the third grade classroom of Sister Mary Lurana in Saint Brigid's parochial school in Westbury, Long Island, was a mouthy, obstreperous kid by the name of William O'Reilly. Quite a handful he was, and so one day Sister Lurana bent over him in exasperation in response to some piece of mischief and told him to his face, "William, you are a bold fresh piece of humanity." Little did she know that she was, early in his career as a troublemaker, defining the essence of Bill O'Reilly and providing him with the title of his brash and entertaining issues-based memoir. In his most intimate book yet, O'Reilly goes back in time to examine the people, places, and experiences that launched him on his journey from being a working-class kid to an immensely influential television personality and bestselling author. Readers will learn how his traditional outlook was formed in the crucible of his family, his neighborhood, his church, and his schools, and how his views on America's proper role in the world emerged from covering four wars on five continents over three-plus decades as a news correspondent. What will delight his many fans and surprise many others is the humor and self-deprecation with which he handles one of his core subjects: himself, and just how O'Reilly became O'Reilly. 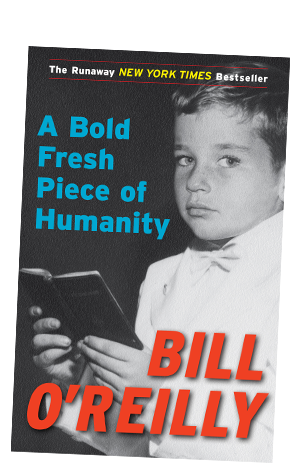 Don't miss an exclusive audio sneak peek of Bill's new book, "A Bold Fresh Piece of Humanity!" Read Cindy Adam's review of A Bold Fresh Piece of Humanity in the NY Post.